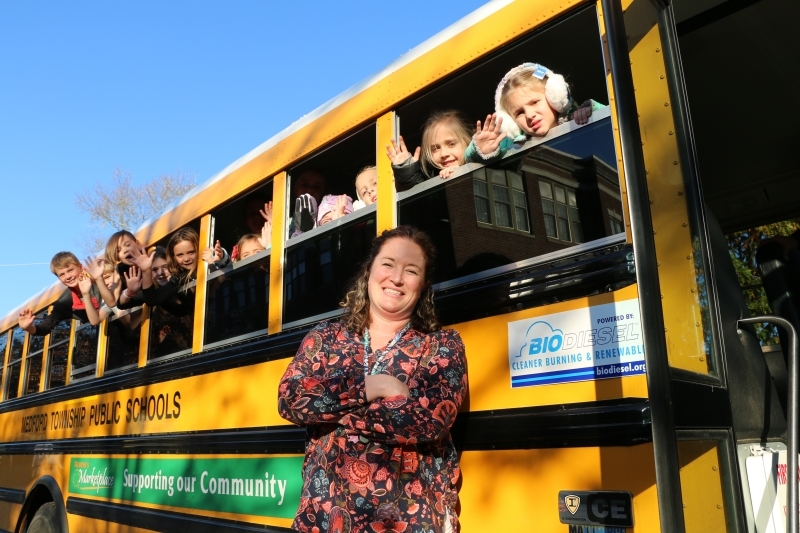 Medford, N.J. – Medford Township Public Schools in Medford, NJ this month celebrates the 20-year anniversary of its transition to cleaner-burning biodiesel in its school bus fleet. Medford is the nation’s longest continuous user of biodiesel in a student transportation fleet. The school district’s use of biodiesel has eliminated more than 123,376 pounds of smog-forming emissions, 2,408 pounds of diesel particulate matter and reduced its fleet operation costs by over $170,000. One of those parents is Jennifer Entwistle, a second grade teacher who also has children of her own who will attend school in Medford beginning next year. “I remember walking out of school and being able to tell that the buses were there before I saw them, because of the smell,” said Entwistle who was in 8th grade when Medford made the switch to biodiesel. “That smell disappeared once the buses started running on biodiesel. On November 17, 1997, Medford filled its first school bus -- a 1998 International bus – with B20. When that bus retired in 2011, it had logged 190,000 miles without any major engine work and still had its original fuel injectors and pump. Medford’s pioneering spirit is an inspiration for school districts and others across the nation who have learned from their example. Numerous awards honor Medford’s achievements including the 2016 EPA Environmental Champion Award, the New Jersey Governor's Environmental Excellence Award and NBB’s “Eye on Biodiesel” Inspiration Award. Lancaster, Pennsylvania-based AmeriGreen Energy has been supplying Medford’s biodiesel for nearly 15 years.